It is very easy to sit for a long time watching the people and the surroundings at OJO Coffee in Bangsar, Kuala Lumpur. Initially I had thought that this medium-sized café with an impressive number of power points dotted around it was an independent. However similarities with CoffeaCoffee around the corner and a couple of other clues (CoffeaCoffee t-shirts) suggest that it is actually part of the CoffeaCoffee chain, something that was confirmed when I asked the barista. 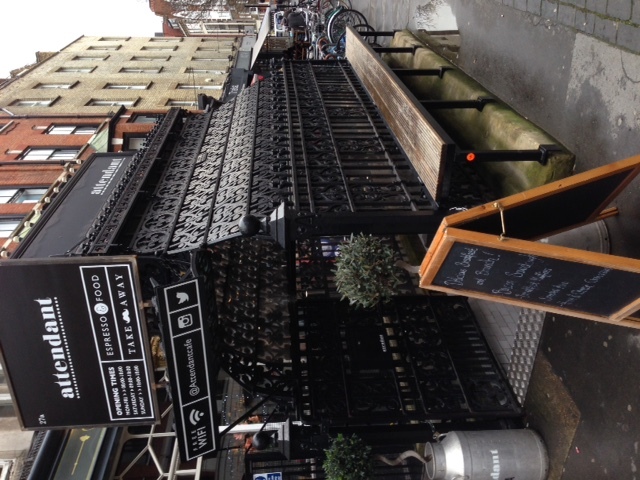 However, the standard of coffee in this chain should prompt some of the smaller independents to up their game a bit (and certainly all of the UK based chains). Not content with just serving the typical coffees of ‘latte’, ‘cappuccino’ etc. (which are made using their own blend), OJO’s additionally serves about 15 types of single origin coffee made with your choice of method (Hario V60, Aeropress or French press). 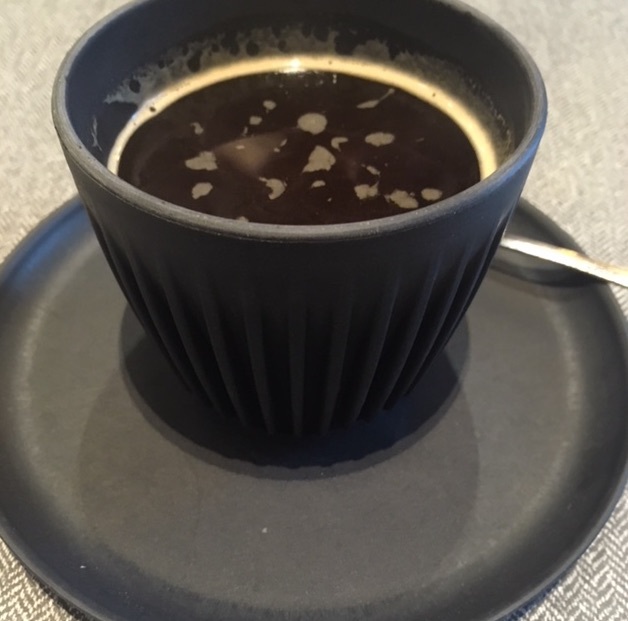 For a while this summer I became a bit of a regular at OJO and so I would particularly recommend the Indonesian Sumatran prepared by V60, but with so many coffees to choose from (from the relatively local Indonesians to South American coffees from much further afield) there is plenty to try at this café. 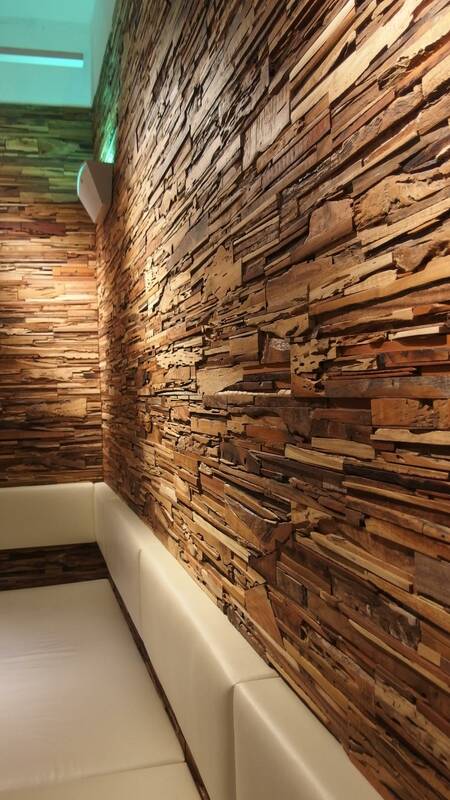 The interior of OJOs is decorated with many types of wood. 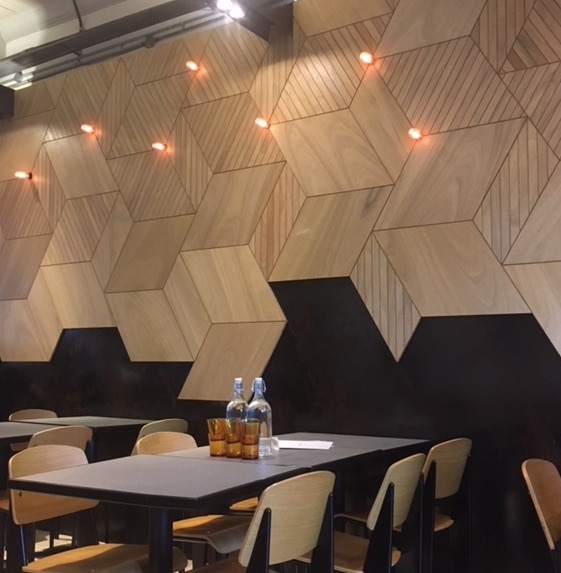 Different cuts of wood are made into a sort of wood mosaic on the wall while the tables are made using several types of wood so as to give a symbolism about the Sun that is a type of motif of the café. Much of the floor is wood too and so this got me thinking about the rainforests in this country. Malaysia has a rich variety of wildlife and forest, it is home to the Orangutan as well as many other species. Teak trees that can be used for more expensive furniture grow along the roadside. Much of this timber can be obtained sustainably and in a way that respects the rainforest and I am certainly not suggesting that the wood in OJOs was anything but sustainable. However, perhaps inevitably, there are many pressures on these invaluable forests. Some of these pressures have, in the recent past, resulted in significant deforestation. One such pressure is that of palm oil. Palm oil is a massively useful commodity. It is now used in food products from margarine to biscuits to raisins (surprising but true, check the ingredients list of a packet of raisins) and non-food products such as soaps. It is literally everywhere. Both Malaysia and its neighbour, Indonesia, have profited enormously from growing and exporting palm oil. Unfortunately, at times the rainforest is cleared to make way for the palm oil plantations. As it is easier to burn felled trees to clear the land rather than to painstakingly pull the roots up by hand, the cleared forest is burned. But the ground is not any ordinary soil, the ground is often peat based which means that the fires on the surface penetrate deep below the ground and produce phenomenal amounts of smoke. If at this point you were wondering where the ‘physics’ bit of this café-physics review is, I assure you it is coming. It is indeed linked to this environmental story and to OJOs, please keep with me. Each year, parts of Malaysia, Singapore and Indonesia are enveloped by a haze produced by this burning peat land (It made the BBC in 2013 when it was particularly bad, but some haze is present for a few weeks every year). Haze has the appearance of thick fog but smells of smoke. At times, visibility can be reduced such that the tops of nearby tall buildings are obscured. Each time land needs clearing for new palm oil plantations, this smoke is produced. The haze can be reduced by local weather patterns but on many days, the haze is cleared by the torrential rains that can occur in this part of the world. It is commonly said that ‘rain clears the air’ but this is not completely true. It is not the raindrops themselves that somehow wash the air free of the dust of the haze, it is the vortices that form behind them*. Just as a spoon dragged through coffee produces vortices behind it, so a raindrop falling through the air forms vortices in its wake. The size of these vortices will depend on the size of the drop and the speed at which it falls through the air; a tea spoon and a dessert spoon pulled at different speeds through the coffee similarly produce different forms of vortex. So the amount of dust that is ‘sucked in’ and falls to the ground will depend on the type of rain that falls. Perhaps if you are in Malaysia, Singapore or Indonesia when this haze is present, you could make a study of which sort of rain clears the air most effectively. I have an idea but not the evidence to see if the idea is correct, it would be interesting to know what you think. As I left OJO one afternoon, the rain had started to come down. The rain, or at least the vortices behind the raindrops, cleared some of the haze that had been around earlier. It is a temporary solution to a longstanding problem. A more long lasting solution may be to start (or continue) asking manufacturers of those biscuits you are eating: just how sustainable is the palm oil they are using? 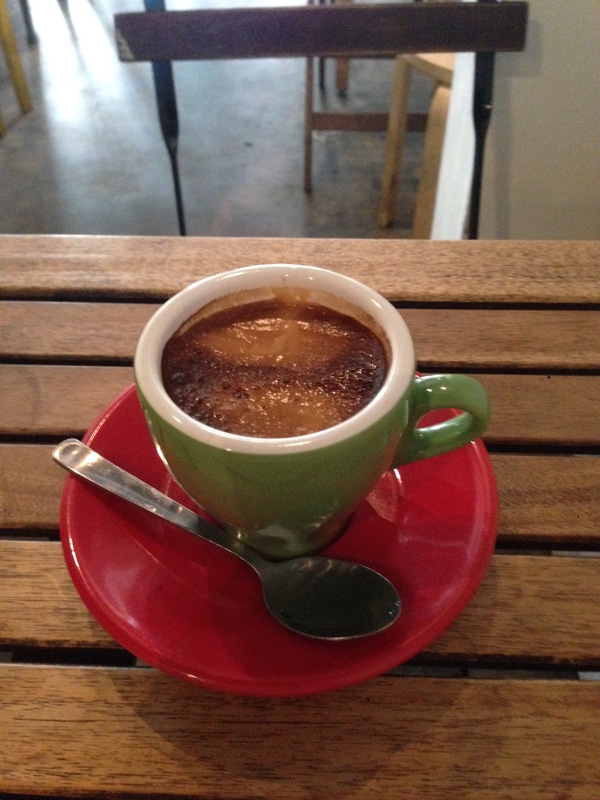 One of the great things about travelling is exploring the different cafe and coffee cultures in different countries. Is it the coffee that is important? Or food, alcohol or maybe just the opportunity for socialising? 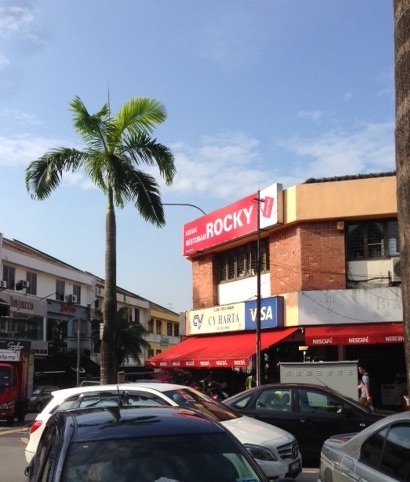 In Singapore and Malaysia, the “kopitiam” (or coffee shop) is a familiar part of each neighbourhood. Each kopitiam serves local coffee (kopi) and a variety of foods which are usually prepared while you wait, from stalls around the edge of the kopitiam. 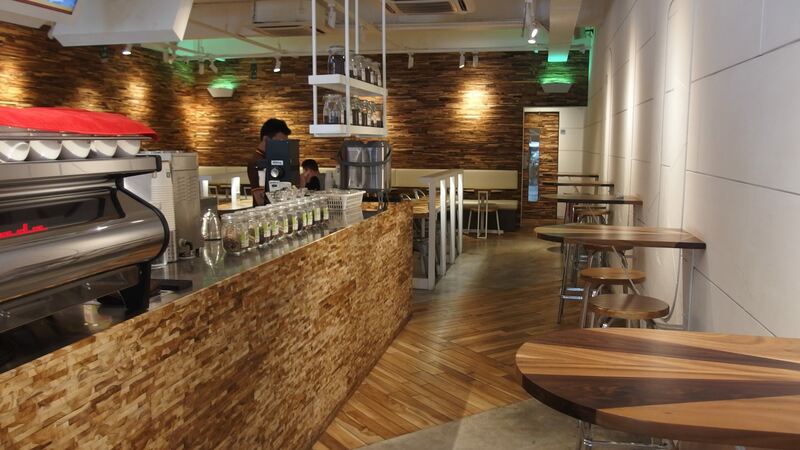 The kopitiam provides a space for socialisation and meeting people over a bowl of steaming noodles. Inside electric fans are blowing continuously in an effort to lessen the heat. 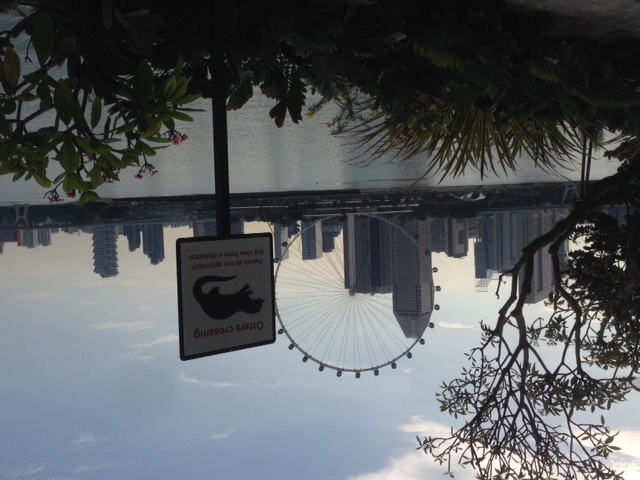 Frankly, the local coffee is not to my taste but there are plenty of other things to eat and drink in each kopitiam. A breakfast of “kueh” and black tea for example is a welcome change from toast at home! 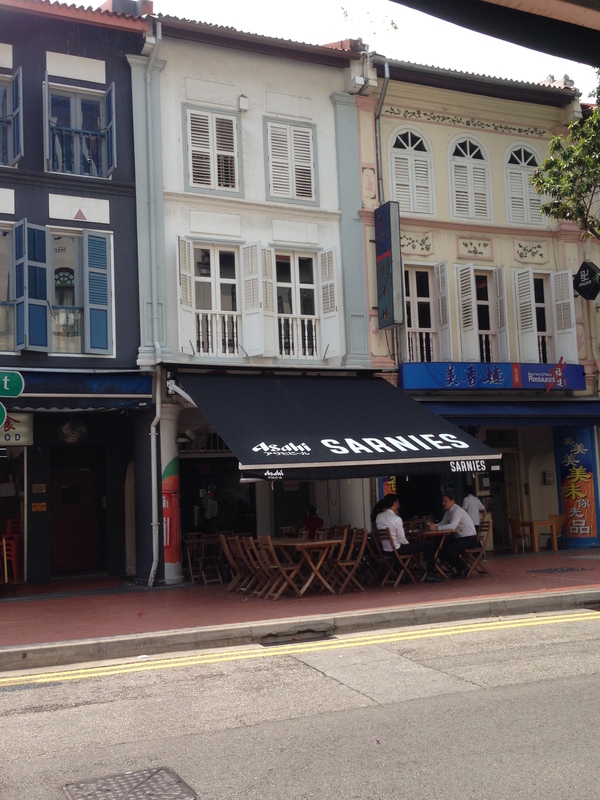 In many areas of Singapore, and to a lesser extent Malaysia, local kopitiams are closing to make way for the new style cafés which serve a range of freshly roasted, pour over or espresso based coffee. Not being Malaysian or Singaporean I do not want to comment too much on that, I guess it is similar to the decline of the “caffs” in the UK. Mourned by many in the community but welcomed by others for the improved quality of the coffee. An everyday example of refraction. 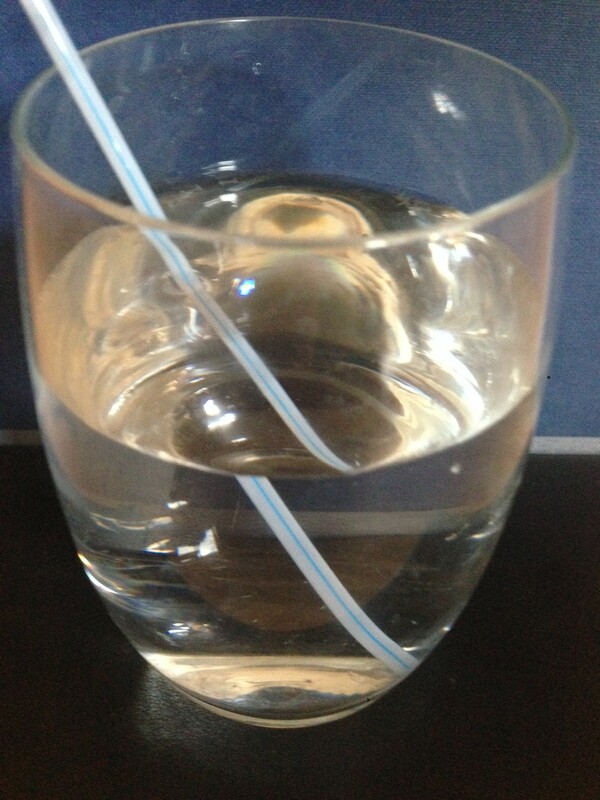 The water refracts the light to make the straw appear ‘broken’. 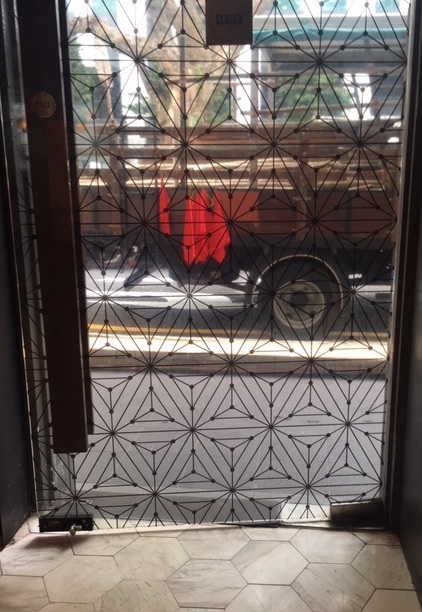 However, with so much going on in a kopitiam, the temptation to look at a kopitiam-physics review was too great, especially when I started to “see things” at the edge of the shop. Am I going mad? No, it was not that my imagination was playing with my mind; I saw the ingredients for a mirage. 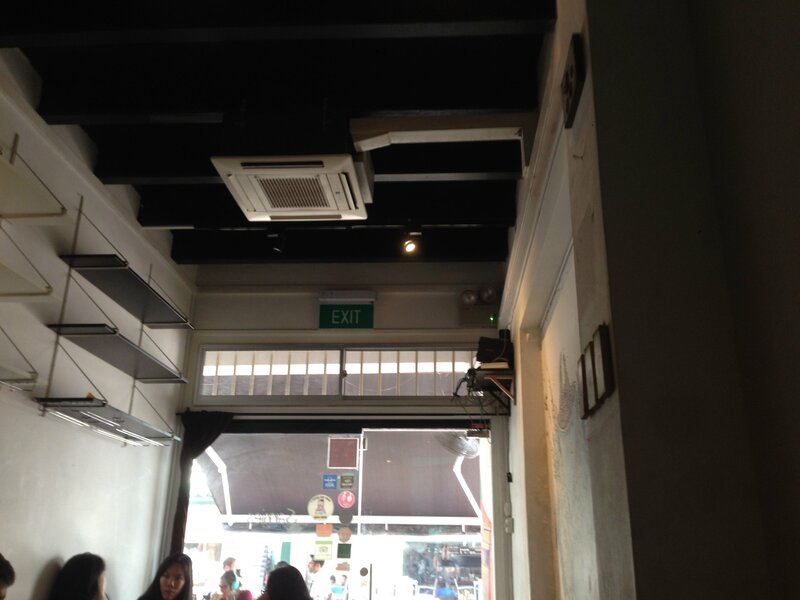 You see, at the edge of the kopitiam the hawkers will cook noodles, or rice dishes etc. and this creates heat. Above some stalls there will be clouds of steam rising as the noodles boil in a pan. The clouds appear white because of the scattering of light by reasonably sized water droplets (more info here and here). Above other stalls, there is no steam but the heat created by the cooking makes the air immediately above the stove warmer (and therefore less dense). This less dense air refracts light less than air at room temperature. It is refraction that causes that straw in your iced coffee to look as if it is broken as you look at it (see picture). In the kopitiam, it means that as you look through this region of warm air you see a wobbly or wavy type pattern as the light from outside is refracted by different amounts depending on the temperature of the air that it goes through. It is this that is the primary ingredient for seeing a mirage. The fact that air at different temperatures refracts light by different amounts is the reason for mirages in the desert. Frequently, warm air is trapped at ground level by a layer of cold air above it. The light is bent as it travels through these layers (see diagram here) and so it may appear as if they sky is on the ground (which the brain will interpret as a pool of water on the ground). Conversely, if there is a layer of cold air trapped beneath a layer of warm air, the light is bent downwards and so objects that are usually below the horizon due to the curvature of the earth can be seen (illustrated by the diagram here). 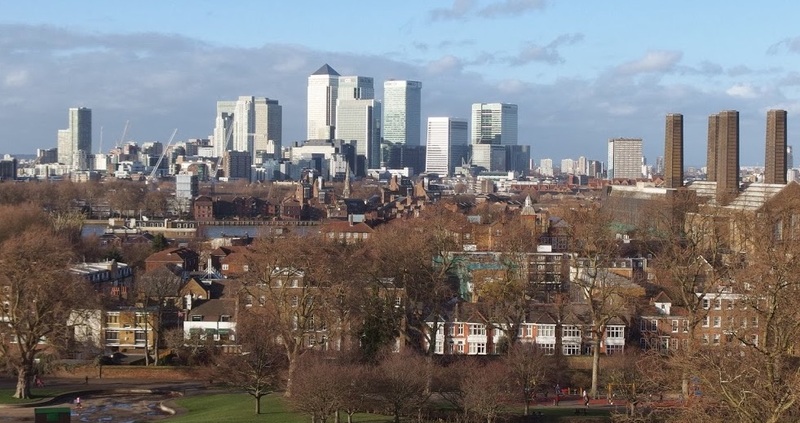 The view towards the Isle of Dogs (and Canary Wharf) from Greenwich. Things have changed a little since Halley’s time. 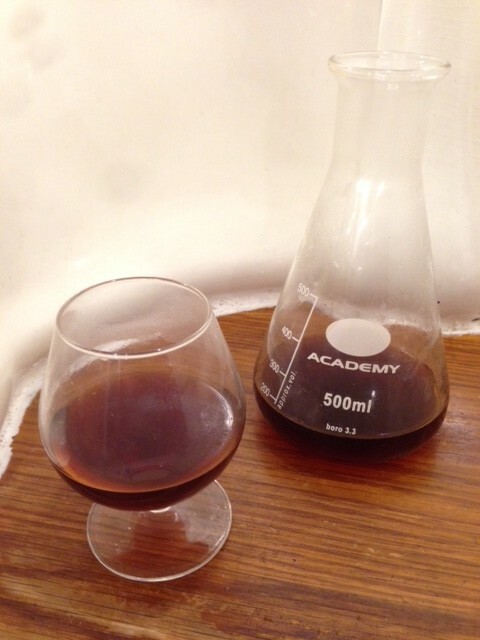 Back in 1694 Edmond Halley (who drank coffee with Isaac Newton at the Grecian) was investigating the evaporation of water as a function of temperature. He wanted to see if evaporation alone could explain the rainfall and the quantity of water in the river system. As he did so he noticed that, in still air, there was a layer of water vapour that formed above the bowl of evaporating water. He noticed this because it refracted the light in an unusual manner. At the time, there was reported to be an unusual phenomenon that occurred at high tide near Greenwich. It seems that cows used to graze on the Isle of Dogs in London. Ordinarily the cows could not be seen from Greenwich because they were too far away, but occasionally, at high tide, the cows would be visible. Putting together what he knew about the evaporating water Halley wrote “This fleece of vapour in still weather… may give a tolerable Account of what I have heard of seeing the Cattle at High-water-time in the Isle of Dogs from Greenwich, when none are to be seen at low-water (which some have endeavoured to explain by supposing the Isle of Dogs to have been lifted by the Tide coming under it.) But the evaporous effluvia of water, having a greater degree of refraction than the Common Air, may suffice to bring these Beams down to the Eye, which when the Water is retired, and the vapours subsided with it, pass above, and consequently the Objects seen at the one time, may be conceived to disappear at the other”*. I think that although he had the mechanism correct (in terms of refraction), the cause of this odd refraction was temperature inversion and a layer of cold air immediately above the Thames rather than water vapour but what do you think? Let me know in the comments section below.